Schlock Treatment: 18th April 2008: Jack Nicholson in the Philippines double! 18th April 2008: Jack Nicholson in the Philippines double! 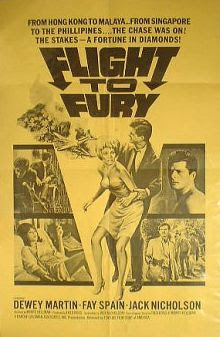 First tonight is Flight To Fury from a script by Nicholson, who wrote himself the role of antagonist. The film’s protagonist is Joe Gaines (Dewey Martin), a penniless American drifter in South East Asia cadging drinks off fellow American Jay Wickham (Nicholson), self-professed bad luck Jonah and card carrying nihilist. A chance meeting with the aloof beauty Lai Ling Forsythe leaves one dead body and Gaines on the next plane out of the country along with Wickham, slimy businessman Vincent Lorgrin (Vic Diaz), and blonde companion Destiny Cooper (Fay Spain). Characters, secrets, murky motives and a subplot of missing diamonds are set up before the plane crashes wiping out several passengers and forces the survivors to make their way through the hostile environment battling the anonymous jungle, their own mistrust, and a group of bandidos led by the sleazy, lecherous Garuda, played by future Philippines president Joseph Estrada. 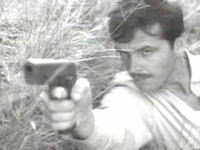 The veteren of almost 200 Tagalog films, curiously this is his only English language film, as his small but utterly memorable role is the only one in the cast to match the greasiness of the venerable Vic Diaz. Nicholson, of course, is the Creator of Flight To Fury’s paranoid microcosmos and, as such, gives himself the most intriguing character and the film's best lines ("Are you interested in death?"). 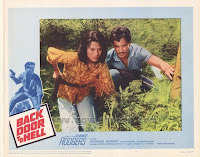 In typical Filipino fashion, the film’s co-producer Eddie Romero and frequent collaborator Mike Parsons made a local version called Cordillera after the American cast left, using local actors and his own Tagalog script. In a country where 90% of their film history has not survived, this version has not surprisingly disappeared forever. But we are left with the Nicholson/Hellman version, perhaps the finest moment from their combined early careers: the 1964 Flight To Fury. 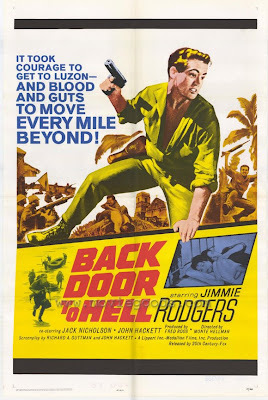 Now to our second film, Back Door To Hell, a taut World War 2 drama with a similar look to the other b&w war films made in the Philippines at the time by Eddie Romero and American B actor George Montgomery. Unlike those films, however, there’s no rousing gung-ho speeches here; it's made clear from the start these men, much like the director himself and Francis Ford Coppola after him, are slowly falling to pieces in the Filipino jungle. The Apocalypse starts now. Jersey: "We're all gonna die anyway - tomorrow, next week, 30 years from now. Did that little thought ever penetrate your thick skull?" Burnett: "Yeah, once when I was a boy, but naturally I dismissed it as being too outrageous." The American guerrillas team up with Paco, an embittered Filipino resistance fighter whose survival insticts lead him to mistrust both sides; tired of sacrificing his men for his liberators, he's introduced as the man who has tortured Rodgers' contact to death, just in case... In fact, torture is Paco’s preferred modus operandi, as evidenced by his treatment of captured Japanese Captain played by Joe Sison (Filipino goon, also in Eddie Romero and George Montgomery exports). "Interrogating a prisoner is like cooking a goose..." says Paco, almost salivating at the prospect. Stripped of most of its military hardware and pyrotechnics, the film is more a claustrophobic deconstruction of a war film, an exercise in rapid-fire montage filled with simple, cost-effective visuals and quiet flourishes (an incredible 360 degree pan from the Japanese Captain's point of view) and a modest character study of men pushed to the brink. 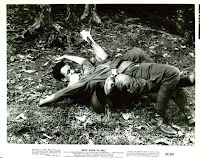 The tacked-on newsreel footage towards the end showing the liberation of Luzon, inserted against Hellman’s wishes by the distributor to make the film more “war-like”, is unwelcome and gratuitous. Surprisingly good in his role as Lieutenant Craig is Jimmie Rodgers, the easygoing folk-rock singer who had a mildly successful career until a drunken incident with a policeman in 1967 left him with a fractured skull and a legacy of brain-related complications. Hellman would eventually recover from his harrowing Philippines experiences and collaborate with Nicholson once again on two westerns, Ride In The Whirlwind and The Shooting, which can only be described as "existential". 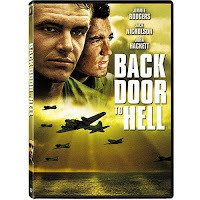 Well, the same term can be applied here: the existential wartime action of Back Door To Hell.